﻿ How to Find C-Level Executives (CEO, CTO, CFO, CIO, CXO) for recently funded startup companies? If you are selling your products and services to Start-ups and recently funded companies, there are many websites that list these companies. For example, AngelList, Zoominfo provides the lists of start-ups and recently funded companies. Using LeadGrabber MF, you can extract your potential companies from these websites and find C-Level Executives (CEO, CTO, CFO, CIO, CXO) along with work email and phone number. Step 1: Select the website from where you want to extract companies. Example: AngelList. LeadGrabber MF supports top company related websites such as PR Newswire, Data.com, Zoominfo, etc. Step 2: Perform a company search. Step 3: To find top management executives of the companies, select "*Append Matching Prospects in Companies" from the LI Management Finder drop-down and click on the relevant executives titles. Example: CXO-VP Level-IT-ENG. The top management executives with CXO titles from those companies are displayed. 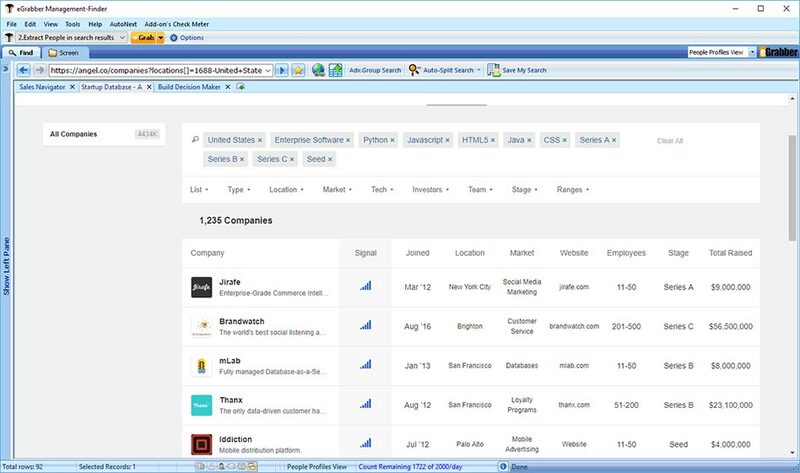 Step 4: To find business email ID of the executives, select the records in the grid and click Append Email option. LeadGrabber MF finds and displays the verified work email address of those executives. Step 5: Select the records in the grid and click on "Transfer" button to export the contacts into Excel/CSV or any CRM /ATS of your choice. Example: SFDC, PCRecruiter.